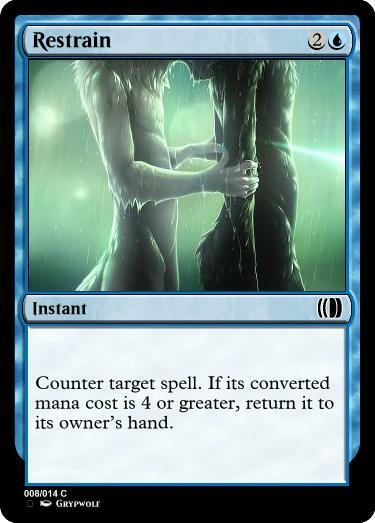 This counterspell can straight up counter a spell that costs the same or less. It can still answer a bigger spell, but only temporarily. I wanted to explore this space because it's problematic for unconditional countermagic to create a mana advantage. I like the pushed version a lot. It doesn't seem unreasonably strong. Most Modern decks would still run Mana Leak over it, which unfortunately has the opposite effect-- punishes high CMC spells over low ones. Yeah, it bugs me how Disdainful Stroke deals with expensive spells so efficiently. 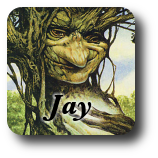 I get that it's the cheap threats that matter in larger formats, but it seems inappropriate for Standard.